When downtime can cost thousands of Euros every hour, a faulty PLC can be a major problem. Replacing the faulty CPU is only half the story, the other half is restoring the correct program enabling the system to continue its operation unhindered. This can mean the time and effort of bringing a PLC down onto the production floor, a frantic search for the original PLC program, and the requirement to initiate a connection between the two devices. The GOT1000 series of HMIs from Mitsubishi Electric include the ability to back up the PLC program within the GOT terminal. If a connected PLC CPU should fail and need replacing, or if the program needs restoring for some unforeseen reason, the program can be restored directly from the HMI, saving time and effort and ensuring production is restarted as quickly as possible. 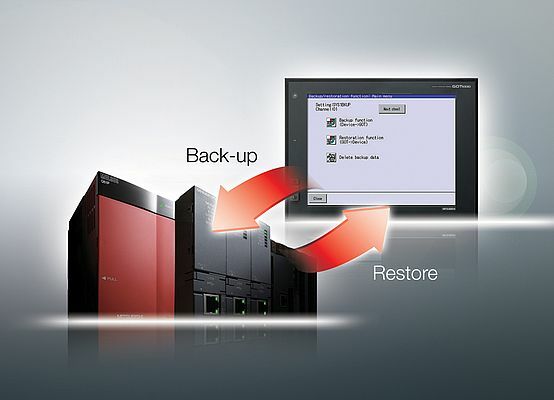 The backup/restore function is simple to access from within the HMI as it utilizes either a CF card or USB stick. The network connection between the HMI and the PLC makes restoring a program quick and easy after a CPU changeover. The GOT1000 series HMIs can thus play a key role in managing product changeovers and maintenance recovery plans, ensuring production efficiency is maintained at all times.